Ninth day of this year’s National Poetry Writing Month. Today’s prompt is let’s rewrite a famous poem, giving it our own spin. While any famous poem will do, if you haven’t already got one in mind, why not try your own version of Cesar Vallejo’s Black Stone Lying on a White Stone? If you’re not exactly sure how such a poem could be “re-written,” check out this recent poem by Stephen Burt, which riffs on Vallejo’s. 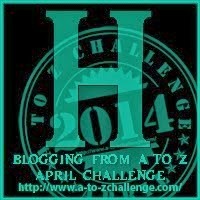 I am participating in A to Z Challenge 2014 where we write 26 posts in a month each day on one word from A to Z barring Sunday's. Today's word is "H". I have chosen Namrata’s below poem which she has written as a Guest post on Sheetal’s blog Scribblings. Namrata writes excellent love stories that I have always known, but today I experienced that she has a knack of weaving beautiful poems about love too. She writes at memoirs on her blog Memoirs of Me. Kissing my lips and making me whole. Somewhere between the day and the night it seemed to be. Our love shining around like it always will! And to be held as if you were never broken before! Because you are that flame that kisses the darkness away and fills it with the joy of love! Here is my attempt to rewrite the above poem, in my words - I hope I am able to do justice to Namrata's piece. You Are My Guiding Light!!! that coming from you means a lot!! !